A penny carnival attendee prepares to launch a frog into outer space. 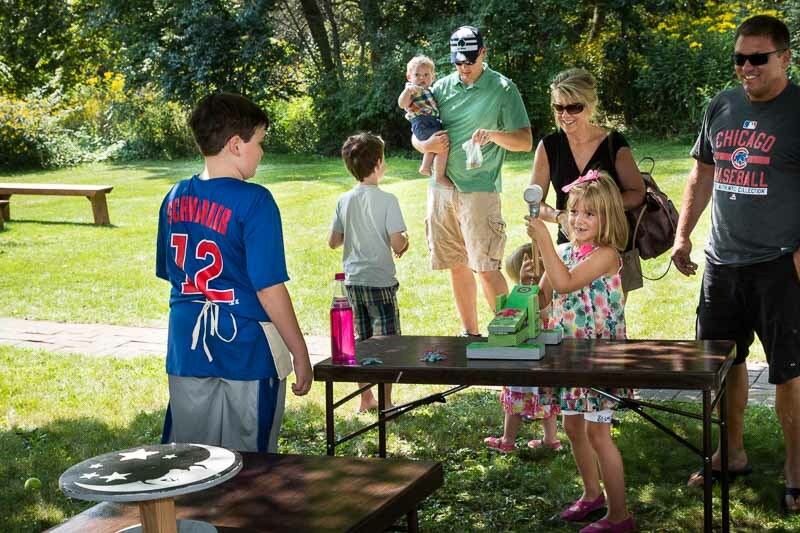 The second annual Penny Carnival sponsored by the Long Grove Historical Society was held this past weekend as part of Vintage Days. 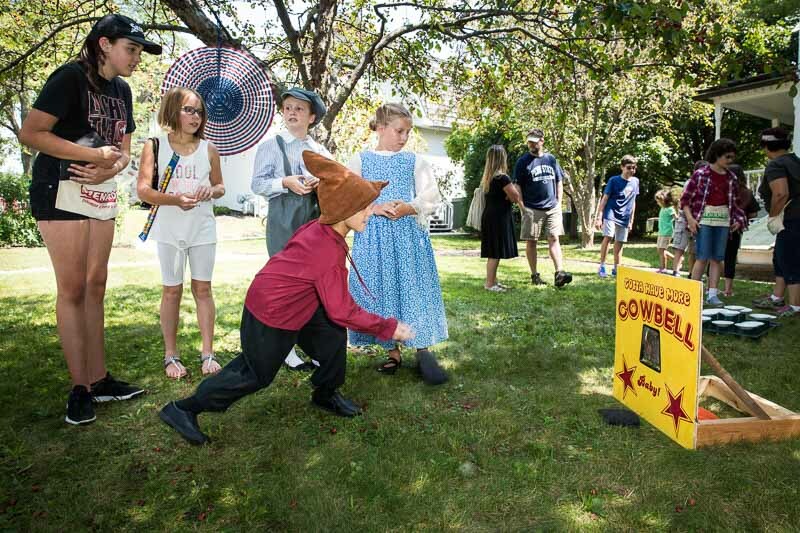 Little kids had a blast playing old-fashioned games on the farmhouse lawn, and big kids had fun running the games, awarding tickets, and helping with the all-important prize redemption. Many parents told us how much they appreciated the simplicity and “un-plugged” experience that the whole family enjoyed. No electronics needed to ring this bell! Two young ladies, Bella and Gabby Minichiello made a special visit to the Penny Carnival all the way from New Jersey. Last year while visiting Vintage Days with their Grandparents, they happened upon the games, had a great time and won 220 tickets! 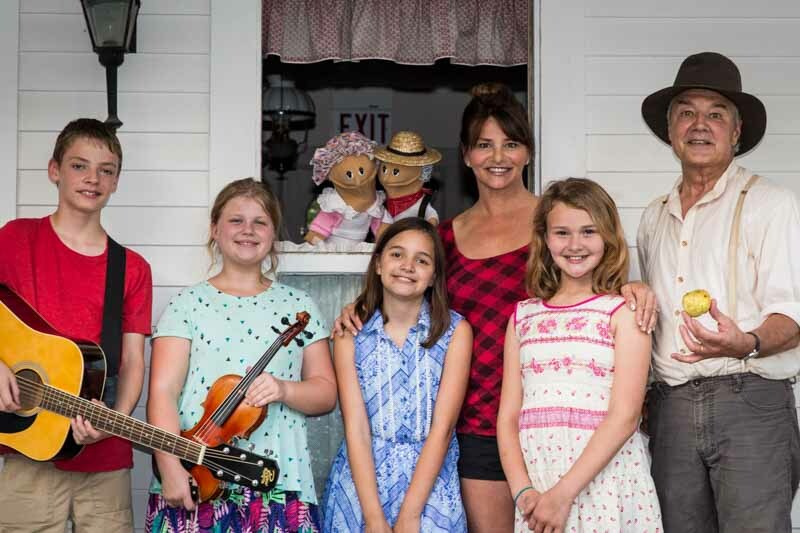 This year they purposely planned their annual visit to Grandma and Grandpa to include the Penny Carnival where they were determined to beat last year’s ticket tally. At the end of the afternoon, they had amassed 393 tickets!! Faced with the daunting task of trying to redeem all of those prizes, they graciously donated 300 tickets-worth of them back to the Historical Society. This story just melts my heart! It was sweet to see the big kids having so much fun helping the little kids. 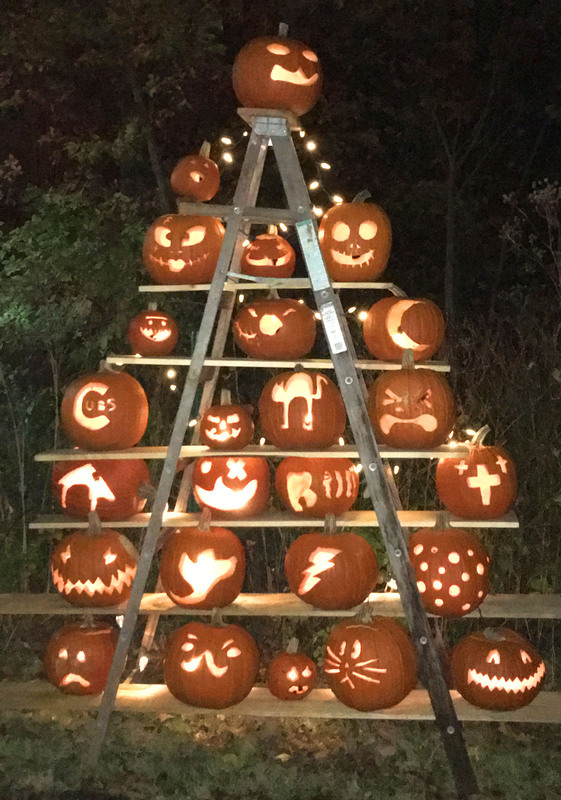 Long Grove merchants and residents worked together to create this display of hand carved jack-o-lanterns welcoming those brave enough to experience Red Riding Hood’s haunted trail. 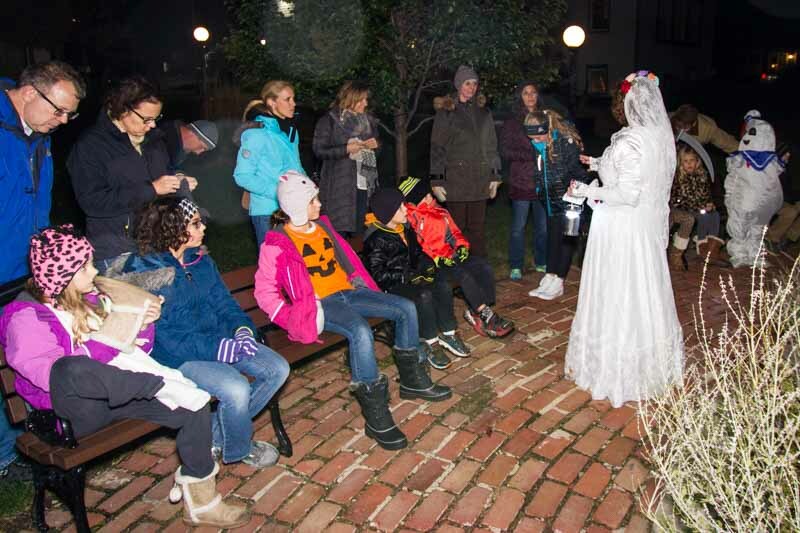 Reading the title of this post might cause you to ask, “What do these three things have to do with Long Grove?” On the Historical Society’s October 28th Ghost Walk, not only could you find zombies, wolves, and an evil doll residing in our village, but the Ghost of Cuba Road materialized as well to scare the nearly 300 children and parents who participated. The Halloween fun kicked off Friday afternoon with Trick-or-Treating in the historic downtown shops. It was delightful to see so many cutely costumed kiddos as I was purchasing embellishments to add to my own witch getup for later that evening. Serving as a tour guide, it was my job to safely navigate families of willing “victims” through our haunted historic district. The route took us past the line of scarecrows on Towner Green, some of which were not quite dead. The zombie dancers at In-Motion returned again this year to entertain, as did crazy Jake Eisler and his stick of dynamite. Good thing Jake was a die-hard Cubs fan, coming back from the grave to listen to the world series game and give us updates on the score! The Long Grove Community Church welcomed us in for a tour of their 1800’s cemetery, featuring the real-life tombstone of one past Long Grovian named Fredriche Krueger. Yes, “Freddy Krueger” was indeed lurking about, as well as many other spirits of the past. A trip back to the safety of the village involved crossing our haunted covered bridge, and a journey through Red Riding Hood’s spooky, wolf infested woods. The tour concluded this year with perhaps the most spine-tingling story of the evening, as Mike Dvorack used sound and light effects to tell the tale of “Arabella” the seemingly sweet yet secretly sinister doll. One father of a 5 year old confided in me that his daughter would probably now be sleeping in Mom & Dad’s bed for the next night or two! 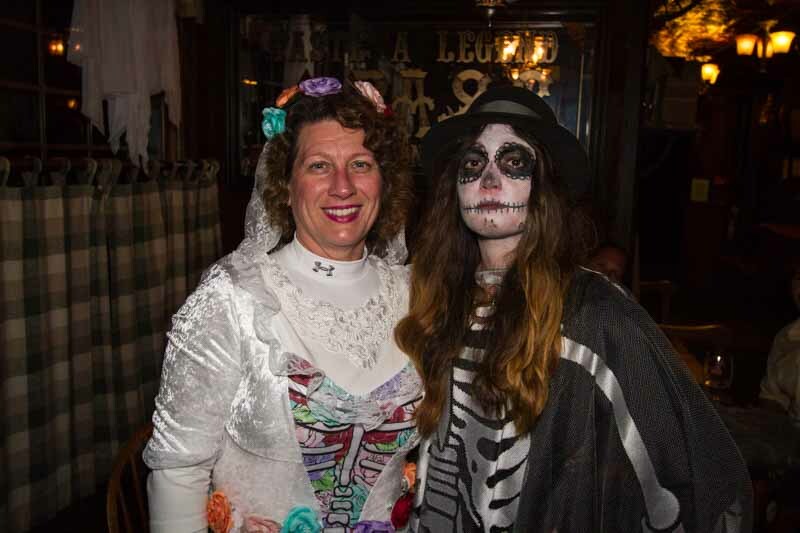 Having fun scaring the children….accomplished. Here’s hoping that your Halloween is equally thrilling and chilling! 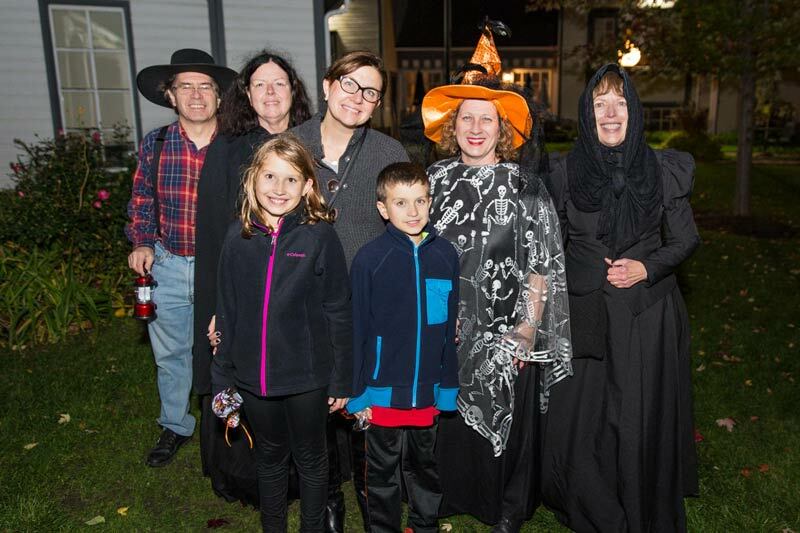 Attending the 2016 Ghost Walk are Long Grove residents (L to R): Doug and Jane Primack, Ellie, Jennifer and Collin Russell, Angie Underwood and Georgia Cawley. 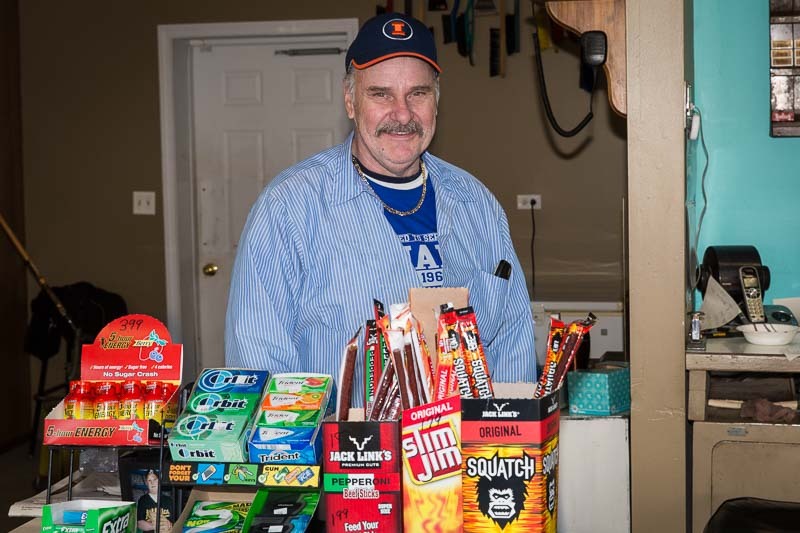 Randy Towner helps carry on his father’s business, Mel’s Marathon Mini Mart, at the crossroads in downtown Long Grove. Every small town has a “hub” from which all real information flows. In my central Illinois hometown, circa 1970’s, it was the local diner, Kathy’s Kitchen. The grain elevator was another hotspot for local news, and I got to witness this firsthand during the summers when I worked for my Dad, who managed the elevator, and my cousin Rita, who managed the office help. Farmers would come in every day to “check the grain prices” but I suspected another reason they stayed and visited with each other so long was the desire to “check the latest chatter” going on around town. In Long Grove, the undisputed central source of information is Mel’s, our crossroads gas station. Originally owned by long-time residents Mel and Dee Towner, the station is built on family property that dates back to the 1920’s and includes the open area now known as Towner Green. The station is currently managed by Mel’s sons Randy and Wendall, who run a mini mart in addition to the traditional gas pumps. Nothing much happens in Long Grove that Randy has not caught wind of almost immediately. When I truly want to find out what is going on in town, I go fill the car up, or better yet…send my husband to find out the latest report. Aaron loves to come home and inform the Village President what information hasn’t yet made it to Village Hall. And if I ever feel the need to verify the advance intelligence, it always checks out. It helps that Mel’s also provides a tow truck for use in emergencies, so communications with the Lake County Sheriff officers are frequent. Case in point: recently a local youth drove a car into a neighborhood pond, and one of my Trustees happened by the scene as the rescue was in process and phoned me. I felt like I had some breaking-news information to tell my husband as he walked in the door, only to have him fill me in with even more details gleaned as he was getting gas for the lawnmower. The Towner family has long held a role in helping our community prosper. Mel Towner served 44 years as a volunteer fire fighter, and Dee Towner’s father donated the land to build our first fire department. The gas station today is a touchstone to our roots as a rural community. If a business in the historic downtown is closing, or a new store opening up, 9 times out of 10 I will hear the news from Randy first. I think it is great that we have a hometown merchant who provides a place to check in and take the pulse of the community; a place where you can experience both a friendly greeting and some local flavor. 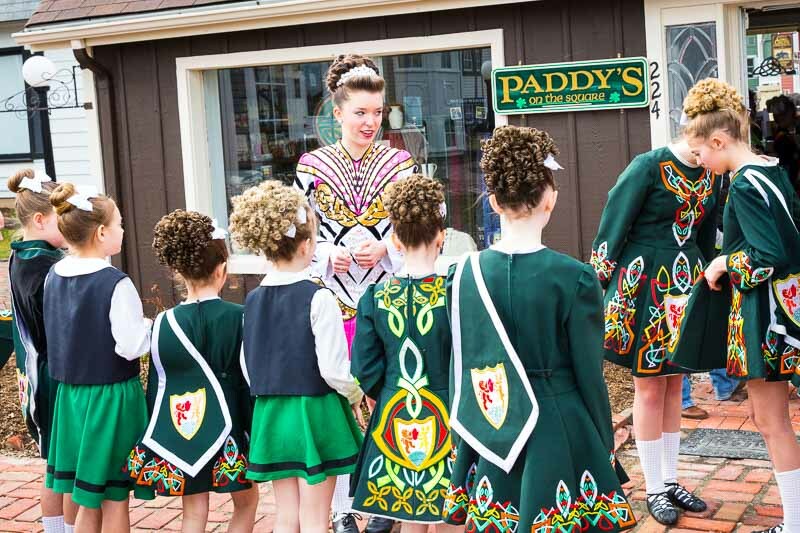 Mel’s is located at the heart of our crossroads and is in a variety of ways the center of what keeps many of us in Long Grove connected. Girl Scouts and Historical Society volunteers prepare to run the games for the younger kids at the Penny Carnival. 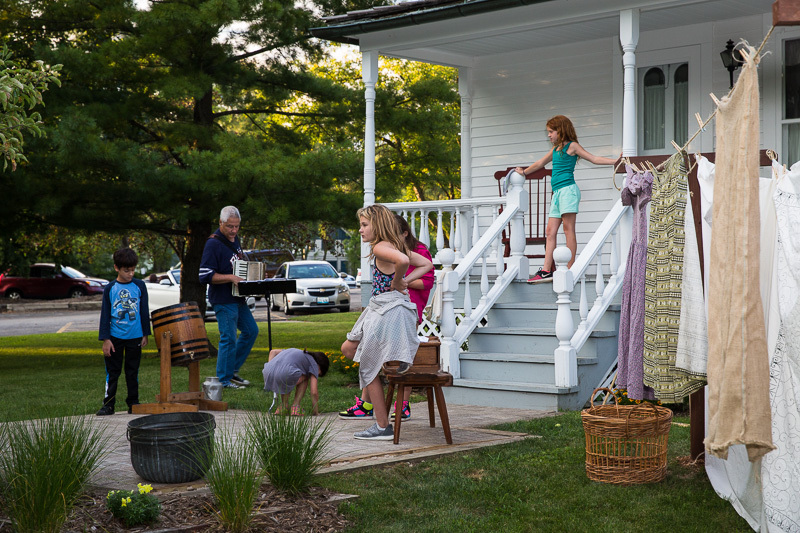 As part of the Vintage Days festivities last weekend, the Long Grove Historical Society hosted a Penny Carnival on the grounds of their restored 1860’s farmhouse. 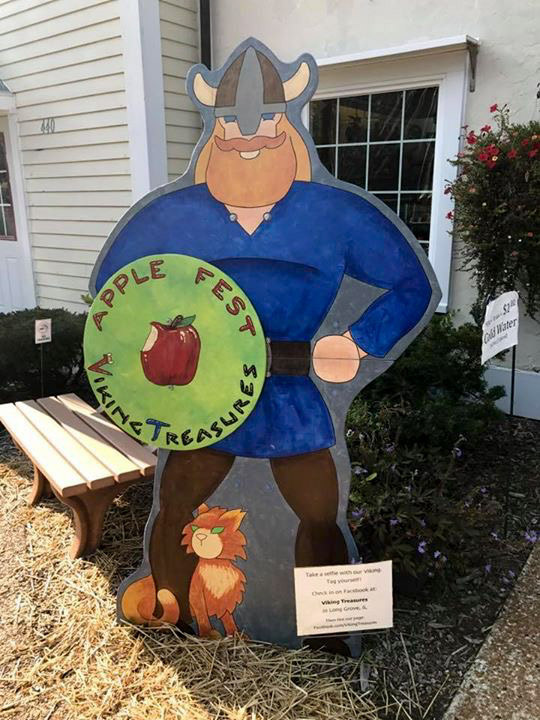 This was not a fundraiser, but rather an event to connect with the community in a family friendly way and participate with the downtown merchants in a lower-key, local festival. It was a huge success and a perfect result of residents coming together to make something special happen. First off, you could not have asked for a more beautiful summer day–cool, clear, and comfortable. The girl scouts and Historical Society volunteers were ready and waiting, after spending the previous weeks concocting games to entertain our local families. For example, my household was home to the creation and construction of both the “More Cowbell, Baby” bag toss, and the “NASA Frog Launcher” game. 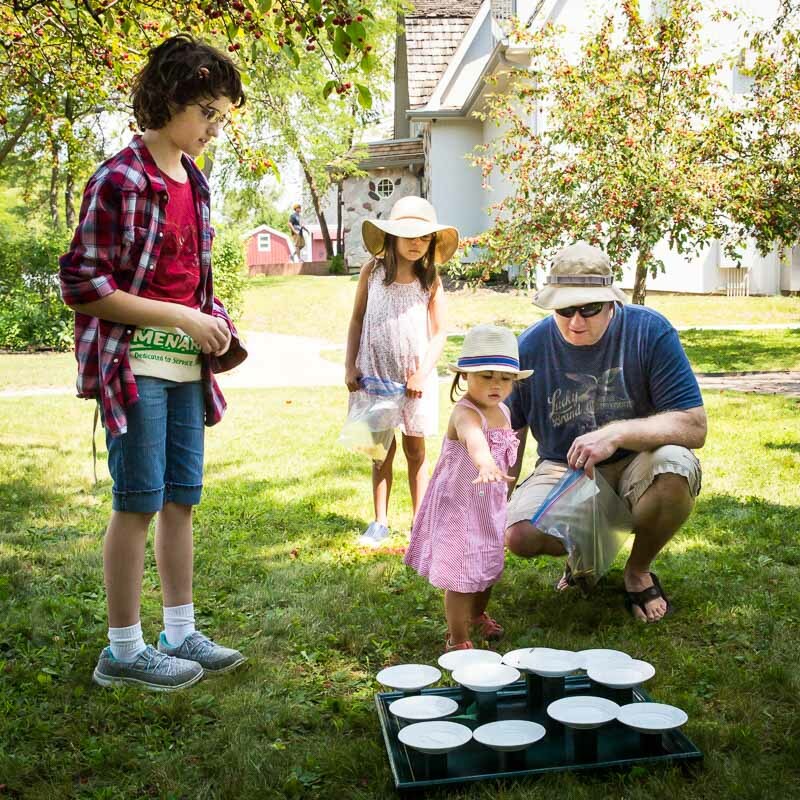 Other vintage-inspired games included the penny toss, bottle rings, duck pond, and tin can knock-over. The cost to play was one penny, and the kids received tickets which could be redeemed at the end for prizes such as penny-candy, trinkets, and small stuffed animals. As this was a first-time event, nobody knew just how many families to expect, if any. We were pleasantly overwhelmed with nearly 150 families spending their Sunday afternoon having old-fashioned fun on the farmhouse lawn. I was supposed to conduct tours of the museum, but instead was assigned to pitch in running a game and I served a constant line of happy children for two hours straight! I don’t know whether to blame Mike Dvorak, our “carnival barker” or John Kopecky, our “wagon driver” for bringing in the crowds, but at one point I looked up to a line of 30 strollers parked all in a row and knew our expectations had been exceeded. In a wonderful way! When I look back at my years as Village President, there are some days and experiences that will be remembered as pure joy. I had a blast helping families and kids with the bean bag toss game! John Kopecky (seated) introduces Historical Society President Aaron Underwood to Fannie, pictured outside of John’s store The Country House. It seems we have a lady-about-town causing quite a sensation. 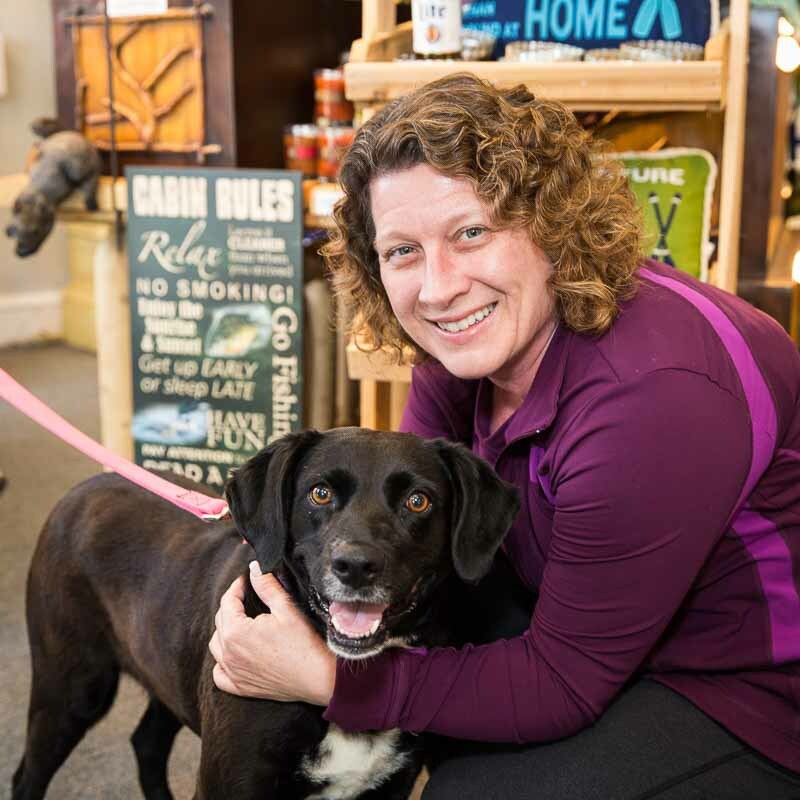 Meet Fannie Farmer, the newest addition to our Historic Downtown Long Grove Association. 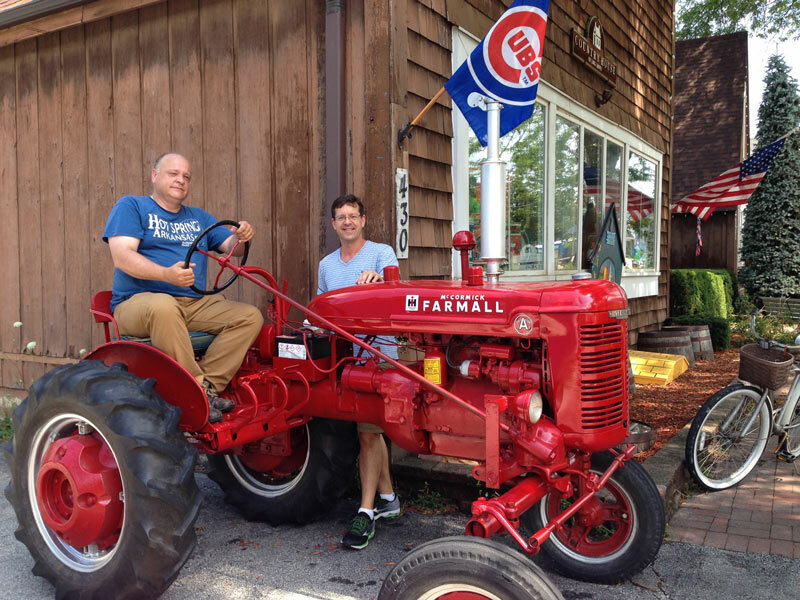 Born in 1942, Fannie is a vintage McCormick Farmall tractor in a flashy shade of red, fully restored and operational. 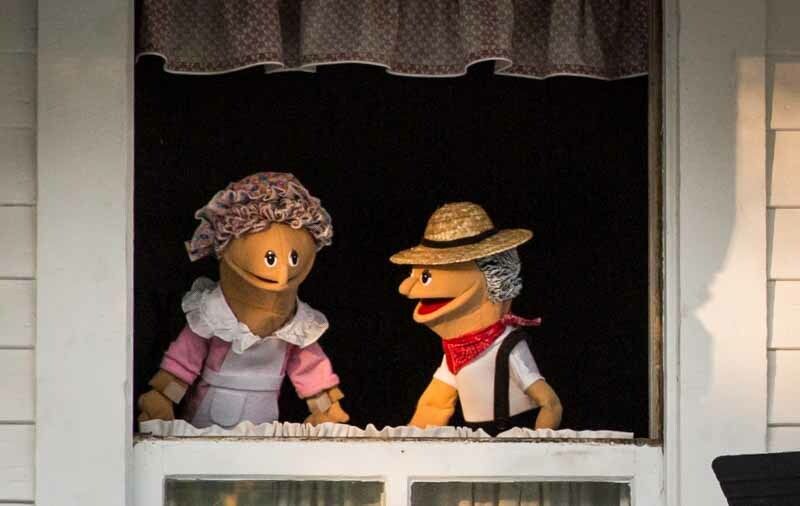 Downtown merchants John Kopecky and Matt Potempa recently acquired Fannie from a farm sale up in Woodstock, Illinois and introduced her to to her new home in Long Grove where she will strut her stuff during the various festivals. Fannie’s inaugural debut will be escorting visitors around town on wagon rides during our upcoming Vintage Days Festival, August 20th and 21st. New this year, Vintage Days will feature music, shopping, and assorted vendors with a flavor of the past. The Long Grove Community Church is offering an old fashioned ice cream social and outdoor services near the Sunset Gazebo on Fountain Square. 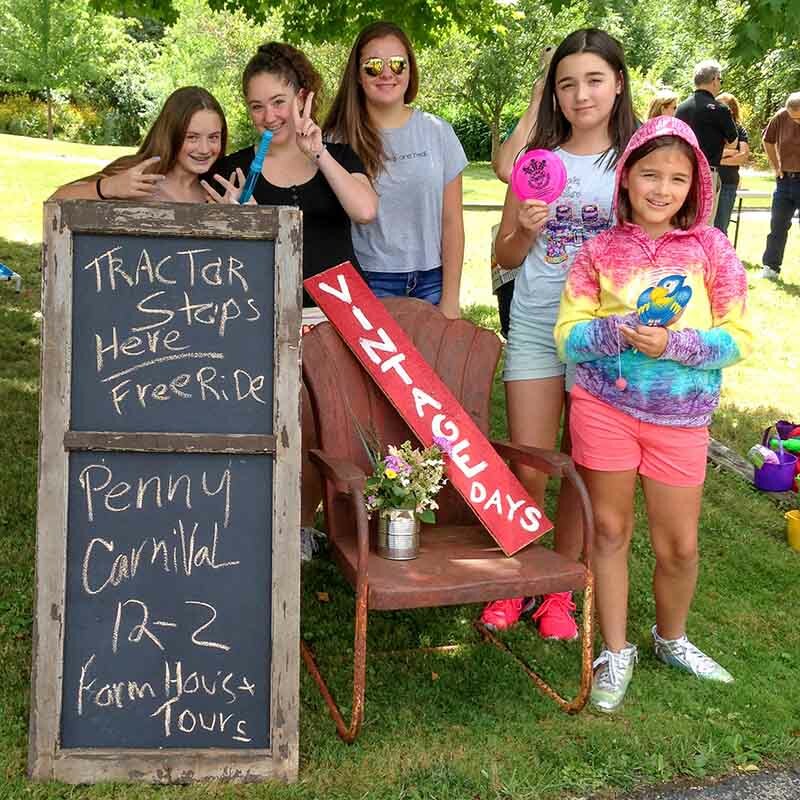 The Historical Society is participating with a family oriented Penny Carnival on the grounds of the Farmhouse, and historical wagon tours of the downtown (here is where Fannie gets in on the action!) Come check it out–Vintage Days is a free local festival that will appeal to all ages. We love Long Grove!! Merchants here provide water for us and sometimes treats! And the wildlife smells are captivating–so many squirrels! But I’m getting distracted…you probably want to know why we were in Mangel’s lovely shop today. You see, Blondie and I are looking for a forever home. The nice people at Mangel’s were giving a portion of their proceeds today to support our no-kill shelter, Save-A-Pet. 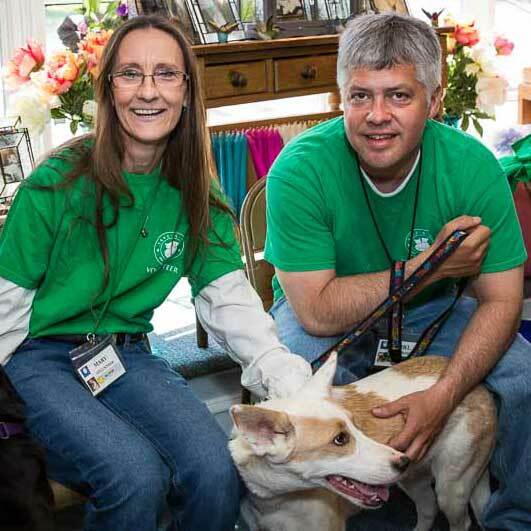 This is a great place in nearby Grayslake that serves as a safe haven for abused, neglected, injured or lost animals. They help give dogs and cats a second chance and serve to foster young kittens and puppies until we are old enough to be adopted. Blondie and I are old enough now!! Village President Underwood adopted her cat from our shelter many years ago, so she can vouch for the care we receive. But as nice as the folks are at Save-A-Pet, what we are really wishing for is to be part of a loving family. You can find out more about us, and about other ways of supporting our non-profit organization by visiting our website at saveapetil.org. Come visit our adoption center at 31664 N. Fairfield Road in Grayslake.